In this map we can see the many different basins and oil-gas fields that exists in the Asia-Pacific Region specially in Australia. Broadly speaking we can see that a lot of multiple fields near to Cunnamulla City belongs to Eromonga Basin almost in the center of that country. I think Eromonga Basin contains the major number of fields in Australia specially in regard to gas. According to the map, another important basin is Surat Basin where the majority of fields are gas too in the east of Australia. Other producing basins are: Gipps Basin (offshore – near to Bairnsdale city) in the east and Northwest Shelf (offshore too) in the west of Australia near to Dampler City. If you enlarge or download (bmp) the image we see through small red dots (gas) and black (oil) producing oil fields in Australia. Original map is a courtesy of the U.S. Geological Survey. Map has been adapted by ENERGIABLOGGER. 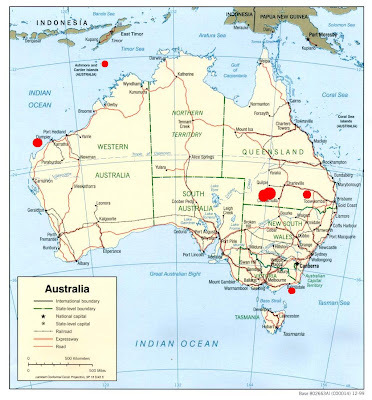 In red circles, principal producers points of oil and gas on Australia having as reference the main cities.